Japan Stock Exchange. Photo by EXECUTOR, Wikimedia Commons. A partnership between the Japan Exchange Group (JPX) and the Singapore Exchange (SGX) could catalyze the growth of the Asia-Africa Growth Corridor (AAGC) – a geoeconomic infrastructure initiative that is the Indo-Japanese counterweight to China’s Belt & Road Initiative (BRI) – as well as augment the equities markets of both bourses, providing a channel for Japanese capital to access the emerging markets of the Indo-Asia Pacific more deeply. relative geographical centre of ‘The Quad’ formed by the USA, Japan, Australia and India – could create synergies between the BRI and AAGC. 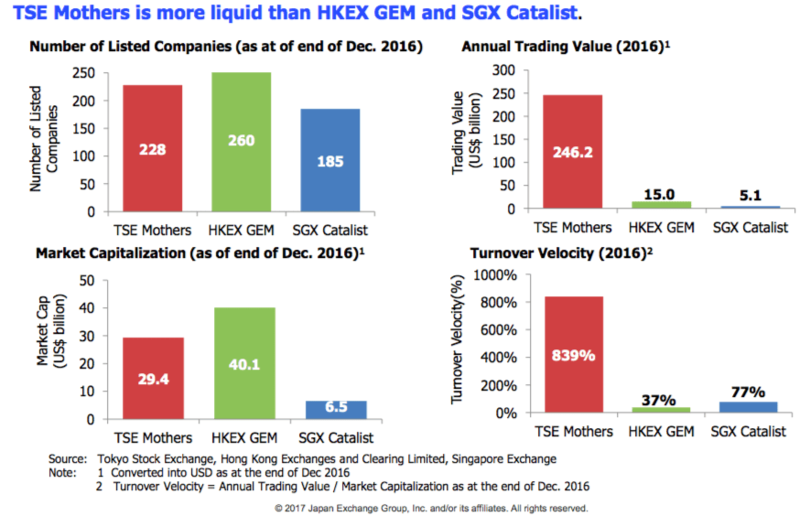 2017 has seen both the SGX and JPX augment their capacities amid rising regional competition. For instance, the Tokyo Stock Exchange (TSE) attempted to make itself more attractive to the listing of mega-cap stocks, such as the public float of Saudi Aramco, though the bourses of Hong Kong, New York and London have been shortlisted for the IPO. However, it has been unable to keep pace with its international rivals, despite seeking the return of international listings to its securities market for a number of years. Arguably, the TSE has not formulated a coherent strategy to challenge regional and global competitors. 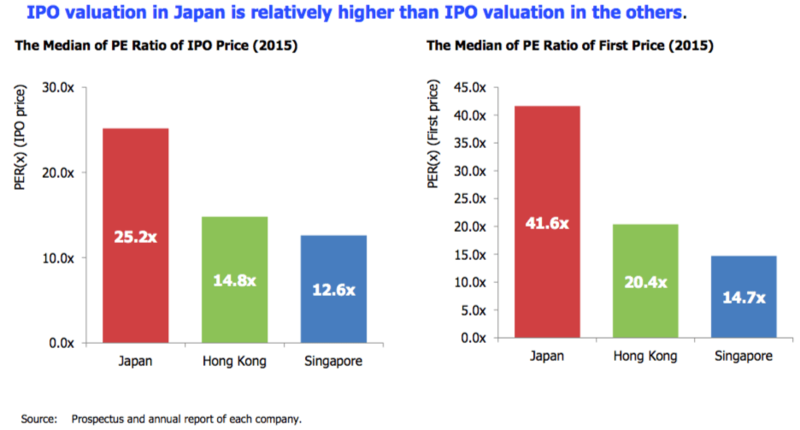 While the JPX is highly profitable – its return on equity exceeds 15% and its effective monopoly in Japan grants it solid footing – it still lags in attracting international listings. It needs to overcome a number of barriers, including the language barrier and recruiting more outsiders for key posts. Meanwhile, in November 2017 the SGX entered into a collaborative listings partnership with New York City’s NASDAQ, in a move aimed at enhancing access to US capital markets. The move will allow concurrent and sequential listings on both exchanges in a move that Loh Boon Chye, the CEO of the SGX, described in an interaction with the South China Morning Post as his “east-west corridor”; this is part of a wider strategy to draw more technology firms and startup ventures to the Singapore bourse. However, he declined to disclosed further details on the partnership. A partnership between the JPX and the SGX – which is already a shareholder in the SGX following the the TSE acquiring a minority stake in the SGX for $304 million in 2007 – could catalyse the AAGC’s infrastructure financing requirements and complement the BRI, as well as augment and amplify the SGX’s and Singapore’s aims of establishing itself as a global technology hub in the Indo-Asia Pacific. China’s BRI raises questions, given concerns over China’s conduct – its questionable practices and laissez-faire attitude highlighted in the wake of Sri Lanka handing over Hambantota to China due to an inability to service its loans – and its broader impact on its foreign relations. Historical precedents established by Tokyo also highlight that Beijing’s BRI ambitions could be compromised by its complex demographic decline and ageing society. 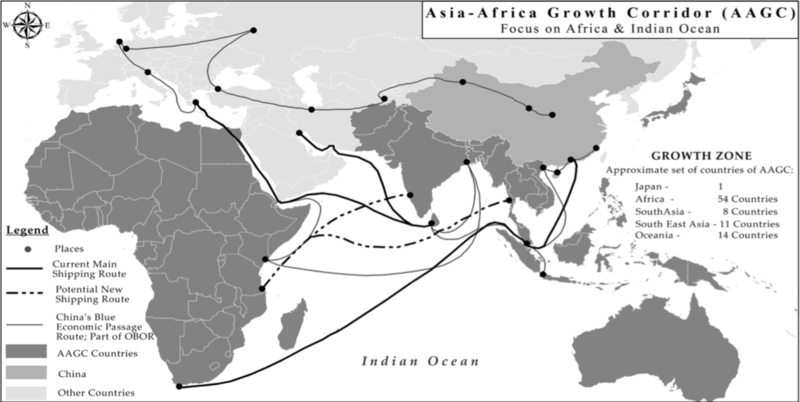 The Asia-Africa Growth Corridor: An India-Japan Arch In The Making? Focus Asia. The sustainability of AAGC – as well as the commitment of Japan and India to its various infrastructure projects – is up for questioning, given that Japan and India both need to implement significant structural changes in order to facilitate sustainable people-to-people exchanges. Both countries suffer from varying degrees of protectionism, coupled with barriers in the form of language and cultural barriers that inhibit the operations of foreign businesses. The SGX-Nasdaq partnership establishes an east-west corridor connecting their capital markets and strengthens Singapore’s key role as an offshore hub in facilitating capital and deal flows for infrastructure and property projects. This could eventually be coupled with a cross-boundary investment channel, such as the Shanghai-Hong Kong Stock Connect or the proposed Singapore-Malaysia Stock Connect, set to be operational at end-2018. A collaboration with the Japan Exchange could potentially have mutually-beneficial multiplier effects, facilitating a seamless connection between private and public fundraising channels for projects under the umbrella of the AAGC. Meanwhile, Singapore is an international financial centre and one of the largest offshore yuan centres, meaning that it can partner Hong Kong and London in facilitating lending to major infrastructure projects. Besides finance, Singapore also has a wide range of high-quality professional services in urban master-planning, engineering, project advisory, dispute resolution and legal services, which can help make infrastructure projects more bankable. It offers a destination with relative geo-political neutrality, as well as the necessary infrastructure and ecosystem for financing both AAGC and BRI projects. The city-state has overtaken the US as the most attractive destination for Chinese investments as of December 2017 and can can play a complementary role in financing the BRI; in Southeast Asia, an estimated 65% of project financing is arranged out of Singapore. This comes at a time when Chinese enterprises and their investments in high technology domains and infrastructure are increasingly shaping ODI (overseas direct investment) efforts. However, the fundamentals that underpin the Singapore-China relationship have also shifted. Despite this, the city-state is in the process of deepening its financial connectivity with Chinese capital markets; Beijing has a long-term objective of internationalising renminbi capital markets, in the interest of facilitating the financial underpinning of BRI projects. Given the contours of Chinese investment and the risk it carries – Southeast Asian states will need investment equal to 5% of their GDP to cover infrastructure growth between 2016 and 2030 – Japanese capital channeled through Singapore to the relevant projects could serve as a counterweight to Chinese capital and influence across the region. China has already made substantial investments in Southeast Asian infrastructure, but tension caused by it South China Sea territorial claims may see countries like Indonesia, Thailand, Malaysia, the Philippines, Myanmar and Vietnam turn to Japan for infrastructure financing. 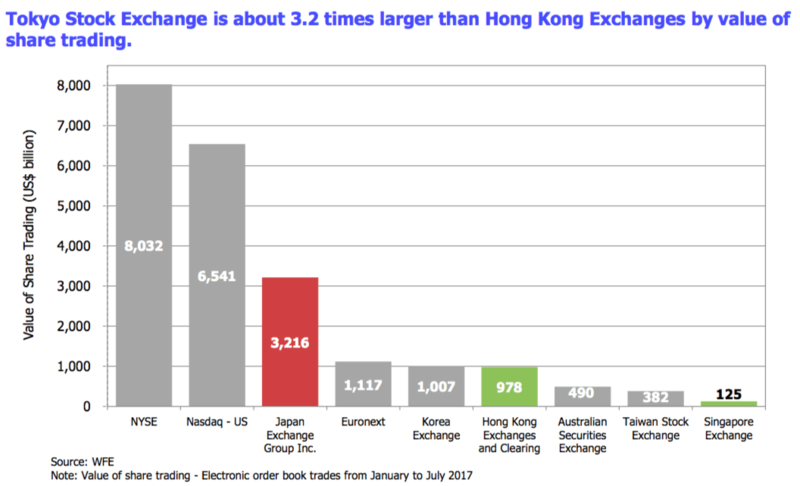 The TSE represents a deep and liquid market – the third largest stock exchange by market capitalisations globally and the largest in Asia, though the Hong Kong Exchange (HKEx) isn’t far behind – with relatively low running costs for issuers, while the SGX is the largest bourse in Southeast Asia by market capitalisation, with an investor pool that has substantial expertise in commodities, property and infrastructure, as well as emerging markets. The TSE, with its Mothers Board, offers a shortcut for technology startups looking to have an early exit or raise capital. It also offers far more liquidity (i.e. turnover velocity) and better valuations for technology stocks than either Hong Kong or Singapore. A partnership along the lines of what the SGX and NASDAQ are developing could help JPX rebuild its pool of international issuers, as well as enable its investor base to gain exposure to emerging market stocks in the form of technology enterprises operating in Southeast Asia and the broader Indo-Asia Pacific, as well as offer a platform for Japanese startups looking to grow their global footprint prior to an IPO. It also builds upon Japan’s edge in financing infrastructure in Southeast Asia, where it dominates infrastructure investment in the Philippines and Vietnam, among the region’s fastest-growing economies. Christian Zhang, an infrastructure analyst at BMI Research in Singapore, told Bloomberg in an exchange: “While Japanese companies and government agencies have had a long head start, Chinese companies have key advantages that could see them overtaking Japan in specific sectors,” citing financing of coal-fired power plants as an example. On the part of the SGX, whose investor base tends to prioritise defensive and income-generating stocks, its telecommunications, media and technology (TMT) sector could benefit from access to a highly liquid investor base that is sophisticated and possesses a deep understanding of and appetite for technology stocks. Moreover, it facilitates access to the strong returns implied by investing in the ASEAN and Indo-Pacific growth narratives. With the recent announcement of an SGX-Bursa Malaysia Stock Connect, which links the equities markets of the Bursa Malaysia and the SGX, developing a comparable stock connection and listings collaboration with the JPX, an existing shareholder, only serves to strengthen its position. In the medium and long term, the synergies that could emerge from such a partnership not only enhance Singapore’s equity capital markets and technology ambitions, which are at a inflection point following the public float of both Razer and the Sea Group, but also open Japan to further foreign listings. Singapore has little hope of beating Hong Kong’s IPO pipeline, given the sheer difference in market size and investor base. Hong Kong continues to remain the gateway and super-connector for what will eventually be the world’s largest economy. Where the SGX can excel lies in its potential for being an Indo-Asia Pacific capital centre and technology hub that offers both neutrality and a strong business infrastructure. Further alliances and strategic partnerships, such as those like the Nasdaq which create an “East-West capital corridor”, as well as stock connections with bourses in mature markets like Japan are likely to be the way forward in boosting its equities market and catalysing its technology and innovation ambitions amid heightened competition in the region. *Shiwen Yap is a STEM enthusiast and a pragmatic centrist interested in the intersection of technology, business, entrepreneurship, science and public policy.